Unfaded Splendour is a groundbreaking exhibition on classical music in Myanmar by Tasaw Lu who tells the inherently transnational story of 19th century development of classical music, a music that has always been embedded in global or asian cultural flows yet has come to be leveraged by elites in narratives of identity politics in Myanmar. “The special exhibition showcases a full set of hsaìng musical instruments and related relics received by the Museum of the Institute of Ethnology in 2013. Hsaìng refers to an ensemble that is composed of several drum sets, gong sets, oboes, clappers and cymbals used in playing music for theater performances, rituals and religious festivals and secular events in Burma. These valuable instruments, along with a large amount of historical documents, field data, sound recordings, and cultural artifacts, such as rarely seen musical instruments and puppets are all presented. With the assistance of multimedia and interactive devices, the exhibition aims to advance the understanding of Burmese classical music and the socio-cultural contexts in which it is embedded. 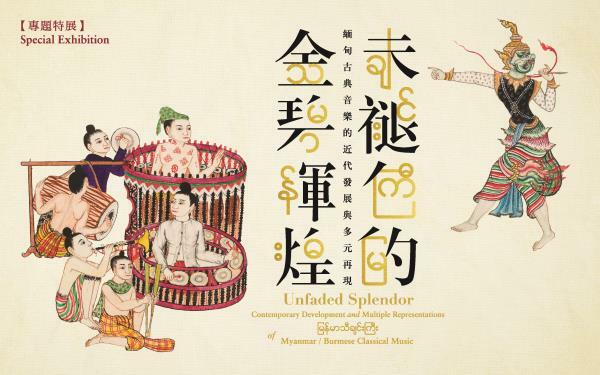 The exhibition also presents a section devoted to modern Burmese musicians showcasing their possessions, photos, and audio-visual records to deepen the sense of the interaction between music, people, and society, and present the viewer with a glimpse into the dazzling world of Burmese classical music. The opening ceremony on September 16 featured a performance by well-known Burmese classical music singer Ma Hlaing Than Tun and drummer Myo Hein Oo, and an audio-visual slideshow that introduced the tracks of the development of the Institute of Ethnology over the past 60 years.